We are an evangelical, Christian church believing that the road to the future runs through the past. And this is really part of what “Ancient-Future” means: Our worship and spirituality are deeply rooted in classic Christianity-- and we’re convinced that the faith and practice of the ancient Church will engage our culture more effectively and provide a way forward in a time of almost unbelievable transition and change. So, first we want you to know that we're not a traditional church, as most folks define it, and never will be. We have little interest in institutional survival or the traditional ways of measuring success. If you are looking for a church with “traditional” or “contemporary” worship, or if you’re a seeker after modern church programs, our community is probably just not for you. We are not a denominational church; we are a pre-denominational church. We are evangelical and orthodox. 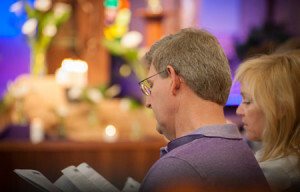 In line with Scripture, creed, and tradition, it is our deepest desire to embody God’s purposes in the mission of the Church through our theological reflection, our worship, our spirituality, and our life in the world, all the while proclaiming that Jesus is Lord over all creation. (From "The Call to an Ancient-Evangelical Future," Epilogue, available from The Ancient-Future Faith Network). As an Ancient-Future Faith community, we want to live out a mission that’s both anciently-rooted and forward-looking. How does that work? Well, part of that mission includes caring about your spiritual formation and growth, but our mission does not include meeting your felt needs, or even necessarily “feeding you”. We believe we grow when we live like Jesus lived and try to do what He did with people. 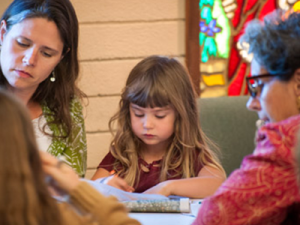 So, you can find members of Epiclesis at worship on Sundays, gathering for prayer and study through the week, and, just as important, ministering to people and walking out their baptisms in our very own community every day. A couple of other resources here on our website that might be helpful to you are the "Note from the Pastor" or, perhaps, the link on Worship. But the very best thing would be for you to come worship with us in person. What’d we’d really love to do is discover how God brought you to us and for us to learn together what your part in His story might be.